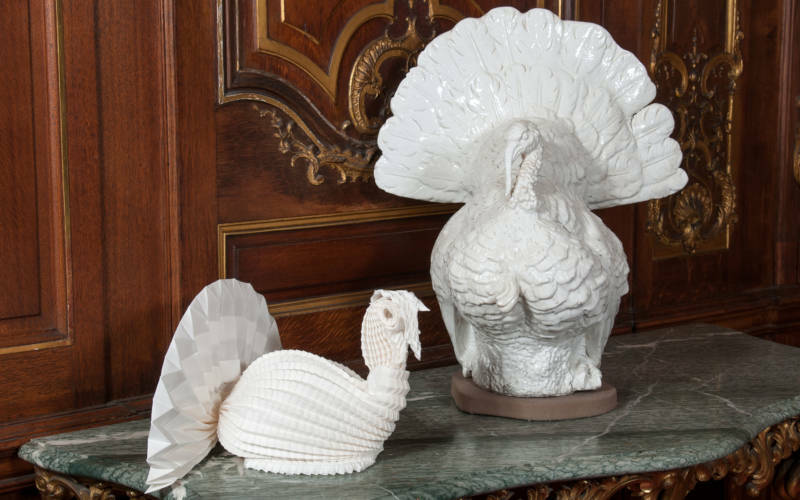 We were delighted to collaborate with the Holburne Museum in Bath on an exhibition of elaborately folded napkins and linen made by Catalan artist Joan Sallas after Renaissance and Baroque patterns. Originally an origami paper artist, Sallas became fascinated with historic napkin and linen folding. He has meticulously researched and mastered this forgotten art and is now the world’s leading virtuoso folder. He has almost singlehandedly revived the extraordinary art that first appeared in Renaissance Italy but reached its zenith in German-speaking lands in the 17th century. Sallas has exhibited across Europe and USA, but never in the UK. The exhibition at the Holburne and at Waddesdon is the first time audiences here have the opportunity to see this remarkable and spectacular art-form from a highly-skilled and passionate artist. The exhibition celebrates the art of folding. When applied to linen, it was used to make table decorations of great intricacy and beauty, both for display and practical use. 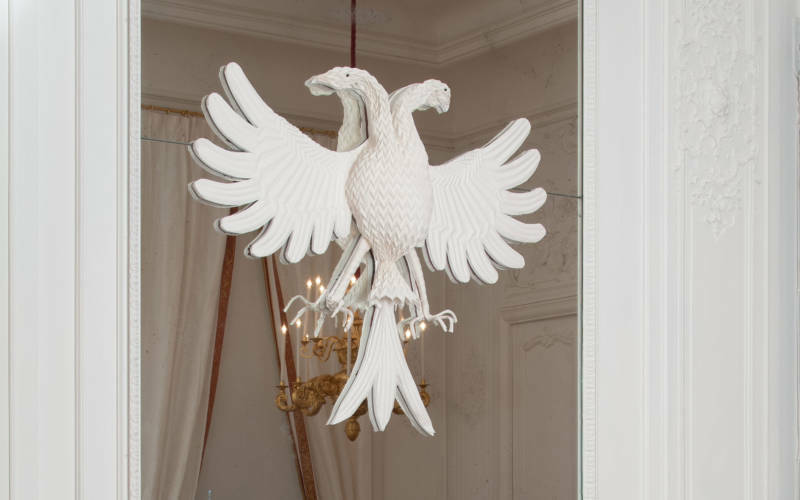 All of the creations at Waddesdon were made by Joan Sallas, who lives and works in Germany, and are based on documented historical patterns. From 22 May, you can see a 1.5m high table fountain flanked by heraldic beasts on the table in the Dining Room, a snake and numerous animals, vegetables and architectural features – all original designs that would have graced the tables of courts and those of high-society across Europe. 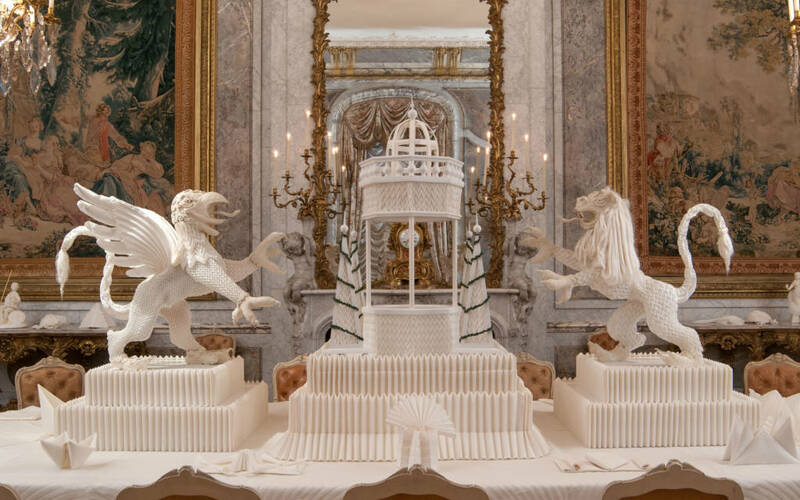 The scale of the linen creations vividly recreates the drama of the dining experience in the Baroque age and relates to the 18th-century ceramics and silver in the collection at Waddesdon. Sallas has also created 19th-century napkins to complement Waddesdon’s history as a house for entertaining, in addition to some of his own extraordinary inventions in linen in the Blue Dining Room.